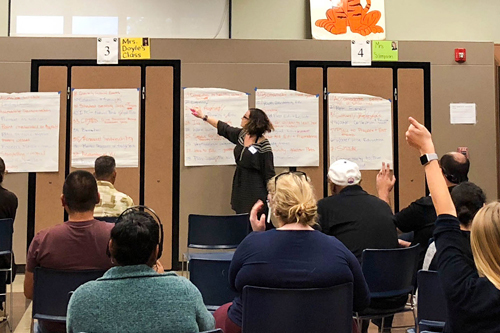 Rooted In Place worked closely with Coastal Roots Farm and Oceanside Unified School District (OUSD) to strategically create a vision, with community engagement, for a vacant school district lot. Rooted In Place facilitated the community input meetings, gathering ideas, themes and values that inspired the design of an inclusive and accessible, farm-themed, intergenerational garden. The garden will be integrated with the OUSD curriculum and will help to build connections to the surrounding community and provide much needed access to fresh produce to the neighborhood. Rooted In Place worked closely with Coastal Roots Farm and Oceanside Unified School District to strategically create a vision, with community engagement, for a vacant unified school district lot. Rooted In Place facilitated the community input meetings, gathering ideas, themes and values that would then be designed into an inclusive and accessible, farm-themed, intergenerational garden. Oceanside community members voiced strong support for creating an ecologically healthy, community space focused on farming, gardening, and education. Rooted played an active role in the engagement and design process. A concept plan was completed in 2018 and OUSD is exploring further funding and partnerships to implement the garden.